This page contains frequently asked support questions regarding LightFactory and its operation. To view the sales specific FAQ click here. Q1 - I have entered the registration code received with purchase but the product still says it is unregistered. 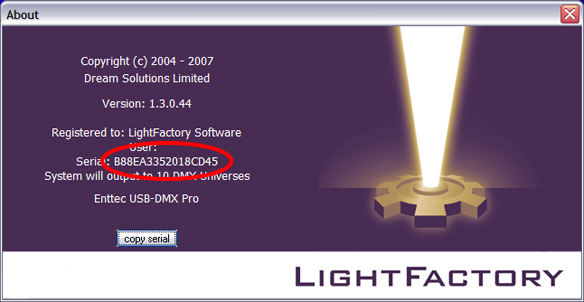 The registration code provided to run LightFactory is linked to the generated serial number. Make sure you have entered the "Registration Code" exactly as received. You shoudl also check that the serial number listed with your registration details matches the one found in the about screen, registration tab of the system properties, or in the title bar of the window used to enter the details. All of the details are case sensitive and must be entered exactly as they appear. Hint: If you received your registration code by email copy it to the windows clipboard and past it into the fields in the registration window. To past use the Ctrl-V keyboard shortcut. If you continue to have trouble with this please contact us by phone or email. Click here for contact details. Q2 - I have plugged in my DMX hardware but don't get any output from LightFactory. Check your channel patching in LightFactory. By default all channels are patched 1:1 with output dimmers. Test the system by selecting reset patch from the "patch options" menu. Check your DMX cable and the first device in the DMX chain. Most DMX hardware have a small light (LED) to indicate the presence of a DMX signal. Check the USB cable and any hubs that may be between the DMX hardware and your PC. Some USB hubs require external power, make sure the power to these devices is switched on. Check to see if you have a power light on the USB-DMX device. If the power light is not lit you will need to check your USB ports to find out why they are inactive. Check that the driver is installed correctly by opening the "Device Manager" on your system. Click on Start -> Settings -> Control Panel -> Administrative Tools -> Computer Management. Select "Device Manager" from the left hand view. The right hand view should now show a list of devices connected to your system. Double click on the item "Universal Serial Bus controllers" to view USB hardware. You should see an entry for your DMX hardware. If you do not see this try reinstalling the drivers by following the instructions in the user guide. Q3 - Where do I find the serial number used to register the software. The serial number required for registration can be found in many places within the software. However the easiest place is in the "About" screen found under the "Options" menu. Open the window (as shown below) and use the number directly following the word "Serial:"
Note: For your convenience the serial number is automatically copied to the windows clipboard when this window is opened or by clicking on the copy button provided. Q4 - Why does Lightfactory connect to the Internet ? LightFactory will also attempt to connect each time you run the software to check for updates. This automatic checking can be turned off in the System Properties. If the problem continues please contact us and include the exact error message you are seeing. Q7 - Can't get line-in / sound input trigger to work. Most problems come from the muting or volume control in the Windows audio settings. Please double check that all the volumes are at full and no inputs are muted in the recording section of the windows volume control.